Hackers have hijacked thousands of exposed Chromecast streaming devices to warn users of the latest security flaw to affect the device. But other security researchers say that the bug — if left unfixed — could be used for more disruptive attacks. The culprits, known as Hacker Giraffe and J3ws3r, have become the latest person to figure out how to trick Google’s media streamer into playing any YouTube video they want — including videos that are custom-made. 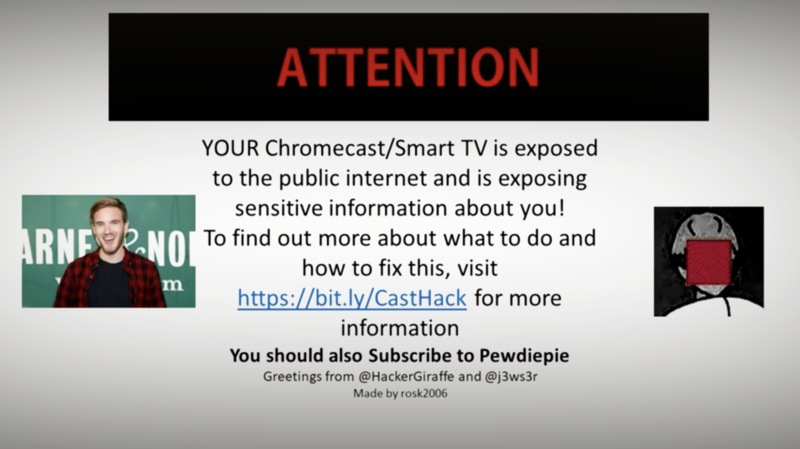 This time around, the hackers hijacked forced the affected Chromecasts to display a pop-up notice that’s viewable on the connected TV, warning the user that their misconfigured router is exposing their Chromecast and smart TV to hackers like themselves. The bug, dubbed CastHack, exploits a weakness in both Chromecast and the router it connects to. Some home routers have enabled Universal Plug and Play (UPnP), a networking standard that can be exploited in many ways. UPnP forwards ports from the internal network to the internet, making Chromecasts and other devices viewable and accessible from anywhere on the internet. As the two say, disabling UPnP should fix the problem. “We have received reports from users who have had an unauthorized video played on their TVs via a Chromecast device,” a Google spokesperson told TechCrunch. “This is not an issue with Chromecast specifically, but is rather the result of router settings that make smart devices, including Chromecast, publicly reachable,” the spokesperson said. That’s true on one hand, but it doesn’t address the underlying issue — that the Chromecast can be tricked into allowing an unauthenticated attacker the ability to hijack a media stream and display whatever they want. Bishop Fox, a security consultancy firm, first found a hijack bug in 2014, not long after the Chromecast debuted. The researchers found that they could conduct a “deauth” attack that disconnects the Chromecast from the Wi-Fi network it was connected to, causing it to revert back to its out-of-the-box state, waiting for a device to tell it where to connect and what to stream. That’s when it can be hijacked and forced to stream whatever the hijacker wants. All of this can be done in an instant — as they did — with a touch of a button on a custom-built handheld remote. Two years later, U.K. cybersecurity firm Pen Test Partners discovered that the Chromecast was still vulnerable to “deauth” attacks, making it easy to play content on a neighbor’s Chromecasts in just a few minutes. Ken Munro, who founded Pen Test Partners, says there’s “no surprise that somebody else stumbled on to it,” given both Bishop Fix found it in 2014 and his company tested it in 2016. He said the way the attack is conducted is different, but the method of exploitation is the same. CastHack can be exploited over the internet, while Bishop Fox and his “deauth” attacks can be carried out within range of the Wi-Fi network — yet, both attacks let the hacker control what’s displayed on the TV from the Chromecast, he said. Munro said Google should have fixed its bug in 2014 when it first had the chance. But Munro said that these kinds of attacks — although obnoxious and intrusive on the face of it — could be exploited to have far more malicious consequences. Amazon Echos and other smart devices are widely considered to be secure, even if they’re prone to overhearing things they shouldn’t. Often, the weakest link are humans. Second to that, it’s the other devices around smart home assistants that pose the biggest risk, said Munro in his blog post. That was demonstrated recently when Canadian security researcher Render Man showed how using a sound transducer against a window can trick a nearby Amazon Echo into unlocking a network-connected smart lock on the front door of a house. “Google needs to properly fix the Chromecast deauth bug that allows casting of YouTube traffic,” said Munro. Updated at 9pm ET: with a new, clearer headline to better reflect the flaws over the years, and added additional comment from Google.